Semiconductor-based light-emitting devices that produce while light are beginning to replace incandescent light-globes in homes and offices around the world thanks to their high efficiency. Researchers have now shown that curing polymer-embedded quantum dots with ultraviolet light can permanently increase the light-emitting efficiency of these elements as part of white-light devices. 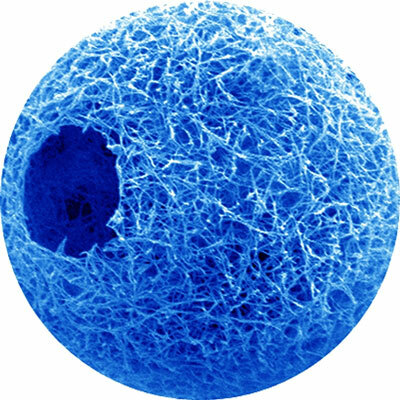 For the first time, scientists have made star-shaped, biodegradable polymers that can self-assemble into hollow, nanofiber spheres, and when the spheres are injected with cells into wounds, these spheres biodegrade, but the cells live on to form new tissue. 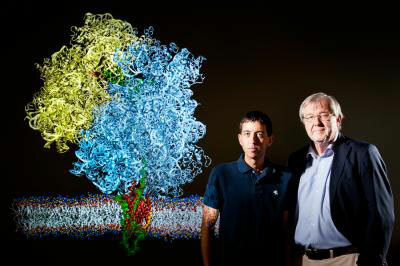 In two new studies, researchers provide the first detailed view of the elaborate chemical and mechanical interactions that allow the ribosome - the cell's protein-building machinery - to insert a growing protein into the cellular membrane. 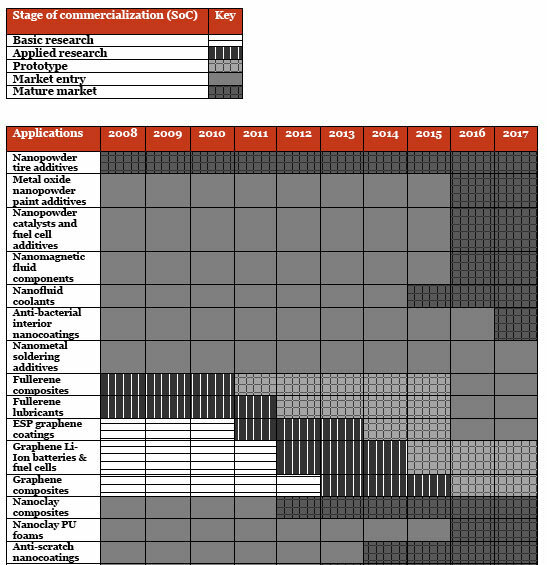 The folks at Future Markets, Inc., a technology consultancy firm, present the second in a new series of commercialization charts on nanotechnology and nanomaterials. On April 15, the Subcommittee on Research and Science Education held a hearing to examine the National Nanotechnology Initiative (NNI) and address the nation's nanotechnology research and development priorities for the future. Archimedes Polymer Technologies (UK Ltd) and Brunel University, London have secured Technology Strategy Board Funding (TSB) to develop a new continuous flow process for separating and sorting commercially available carbon nanotubes and carbon nanomaterials. Scientists from the Institute for Health and Consumer Protection (IHCP) of the European Commission's Joint Research Centre (JRC) performed basic risk assessments for four types of nanomaterials: fullerenes, carbon nanotubes, nano-silver and metal-oxides (nano-titanium dioxide and nano-zinc oxide) following the methodology described in the REACH guidance. 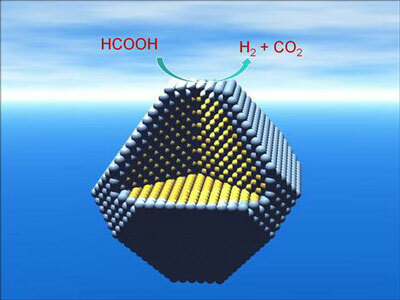 Edman Tsang of Oxford University's Department of Chemistry and colleagues are developing new catalysts which can produce hydrogen at room temperature without the need for solvents or additives. When Gutenberg developed the principles of modern book printing, books became available to the masses. Hoping to bring technology capable of mass production to the nanometer scale, Udo Bach and this team of scientists at Monash University (Australia) and the Lawrence Berkeley National Laboratory (USA) have developed a nanoprinting process modeled on Gutenberg's printing method. Their goal is the simple, inexpensive production of nanotechnological components for solar cells, biosensors, and other electronic systems. In the BASF Dialogueforum Nano representatives of environmental and consumer organisations, trade unions, scientific institutes and churches (Civil Society Organisations / Non Governmental Organisations) work together with employees of the chemical company BASF SE on various issues related to the subject of nanotechnologies. 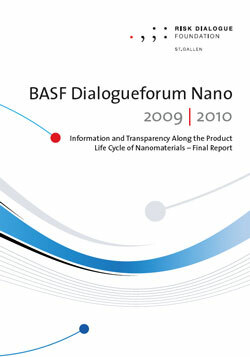 The 2009 / 2010 dialogueforum, led by the Risk Dialogue Foundation, St. Gallen, resulted in recommendations on how transparency and information can be guaranteed along the product life cycle. LOPE-C, the premier conference and exhibition of the worldwide organic and printed electronics community, is steering towards a new record in 2011. More than 95 companies are expected to exhibit on the greatly expanded floorspace of 1,300 square meters at the Messe Frankfurt Forum, Germany. If a new development from labs at MIT pans out as expected, someday the entire surface area of a building's windows could be used to generate electricity - without interfering with the ability to see through them. A dramatic and surprising magnetic effect of light discovered by University of Michigan researchers could lead to solar power without traditional semiconductor-based solar cells. The researchers found a way to make an "optical battery". In the process, they overturned a century-old tenet of physics. 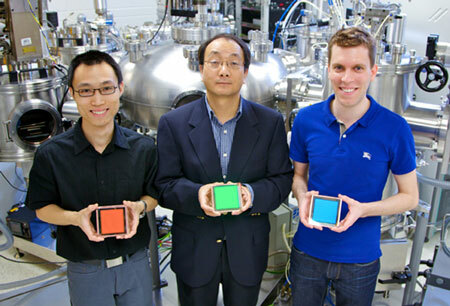 One-atom thick chlorine reduces OLED device complexity while enabling record efficiencies. The Semiconductor Industry Association (SIA), representing U.S. leadership in semiconductor manufacturing and design, today announced that Dr. Jeff Welser testified at a hearing on the future of nanotechnology research and the National Nanotechnology Initiative (NNI) on behalf of the SIA, the Semiconductor Research Corporation (SRC) and the Nanoelectronics Research Initiative (NRI) today in the House Committee on Science, Space and Technology's Subcommittee on Research and Science Education. 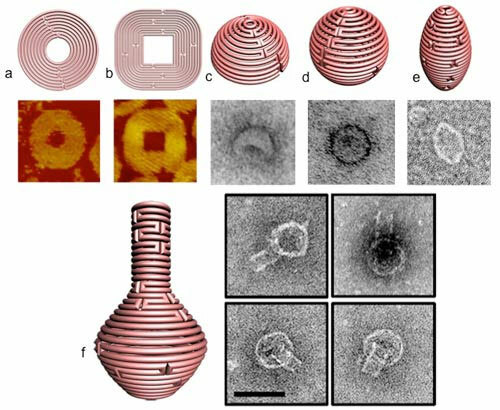 Miniature architectural forms - some no larger than viruses - have been constructed through a revolutionary technique known as DNA origami. Now, Hao Yan, Yan Liu and their colleagues at Arizona State University's Biodesign Institute have expanded the capability of this method to construct arbitrary, two and three-dimensional shapes, mimicking those commonly found in nature.